Time for a new story-by-story review, and one that looks set to take me right outside my comfort zone. I bought the two-volume Oxford Library of Classic English Short Stories on a whim last year after seeing it in a second-hand bookshop, as one of my periodic nudges to myself that I ought to read more old fiction. So, now I’m going to read it. 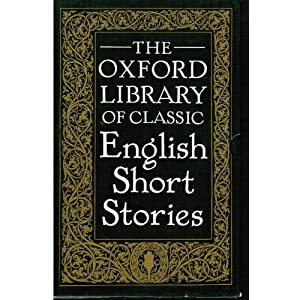 The bibliographic information reveals that the Oxford Library was originally published as four volumes between 1939 and 1976, under the title English Short Stories of Today; this edition is therefore a pair of omnibuses. I’m limiting myself to the first volume for now, partly to see how it goes, and partly because there’s that much more distance between the stories’ original publication and their being anthologised in these books, which gives more weight to the term ‘classic’. I’ve read very little by some of those writers, and nothing at all by most of them, but even I know enough to observe that they’re not all English (judging by the blurb, ‘English’ appears in this context to mean ‘written in English’). I’m more concerned with the quality, though, as I’d expect nothing but greatness from an anthology that calls its stories ‘classic’. And there is, of course, only one way to find out about that — so, it’s time to get reading. EDIT, 24th March: And now I’ve finished. I have a concluding post here.